The Rules of the Road covers EVERYTHING a new driver needs to know in order to become a safe, smart, and skillful driver. Disc 1 starts out by teaching you the rules of driving, helping you ace the written test on your first attempt. From there, the interactive signs index and the virtual driver feature help train driver awareness. You'll also learn parallel parking, highway merging, night driving, right-of-way rules, and everything in between. Disc 2 includes a behind-the-wheel curriculum to assist parents in best instruction practices. It also includes bonus sections on car maintenance, road rage, and safe driving practices. By completing the Rules of the Road, you'll be prepared to hit the open road! The instructor's edition includes a 71-page manual and public performance rights in addition to the 2-Disc set. This item is a Vat19 exclusive! 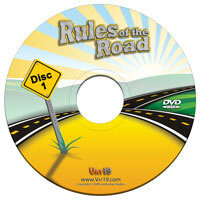 The Rules of the Road 2-Disc DVD Set is the most comprehensive driver's ed DVD on the market. Please view the video below for a short overview of the curriculum. This is the entire How To Use video. It provides a short overview of how to use the program. 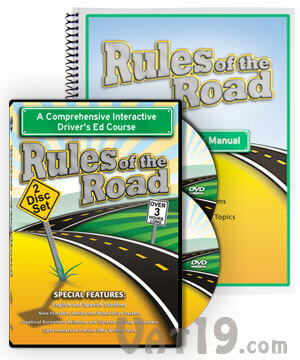 Disc #1 of Rules of the Road is filled with instructional material and interactive features aimed squarely at new drivers. A 20-minute video which covers everything a new driver needs to know in order to pass the written test. Trains driver awareness by forcing the viewer to pay close attention to what is happening all around their vehicle. This DVD can be found in the Apple App Store! Before teens can ever put their car in 'D', they must obtain their learner's permit. Ashley hosts this fast-paced section of the program designed to prepare teens for the written test portion of the driver's test. Watch a short clip from the extensive Passing the Written Test video. Meet the host, Ashley, as well as Adam, Kim, and Molly, three eager teens embarking on a journey toward obtaining their driver's licenses. See how much area around a car can't be seen from the driver's seat. Also learn the BGE mirror setting. Follow Kim as she enters the roadway for the first time under the supervision of her mom, Michelle. Viewers will learn how to enter the roadway, establish a safe following distance, approach intersections, and much more. Michelle explains to Kim how to determine a 3-second following distance. Ride along with Molly and her dad, Mark, as they travel through low speed neighborhoods and on moderate risk multi-lane roadways. Mark guides Molly through many maneuvers including lane changes, specialized turns, and various types of parking. Ashley provides in-depth explanations on space management, 3-point turns, U-turns, and the direction your wheels should be turned when parking uphill and downhill. Ashley finishes with a brilliant step-by-step parallel parking procedure. Ashley explains the procedure for parallel parking. Adam and John begin on residential roads and work on approaching curves, hills and railroad crossings. The focus then shifts to expressway driving. John instructs Adam on a number of topics including passing, exiting using weave lanes, and managing space. Ashley discusses how to approach curves and hills using lane position and speed adjustment. She teaches how to pass on two-lane roads, the importance of commentary driving, how to merge onto expressways, and when to increase following distance. Ashley interviews three people in this lesson. Two of the interviewees explain their frightening encounter with drowsy driving, while the other interviewee is a police officer warning against exceeding the speed limit. Adam gives passing a try for the first time. Ashley follows up with some information about passing on two-lane rural roads. This 23-minute lesson on drug and alcohol awareness features Ashley discussing the negative effects of driving under the influence of drugs and alcohol. Ashley then introduces a series of related videos. This video includes an in-car interview with Corporal Parrish of the Missouri State Highway Patrol. He speaks on a wide spectrum of topics, including the effects of drugs and alcohol, the gruesome accident scenes he has witnessed, zero tolerance law, and the embarrassment teens face when arrested. This video also includes an emotional interview with Tom Bitter, former President of the Gateway Chapter of M.A.D.D. Tom was a drunk driving offender until his 17-year-old son was killed by a drunk driver. While drunk driving fatalities often make the headlines, Ashley wisely discusses the other costs of driving drunk that aren't often mentioned. This includes interviews with a police officer, a lawyer, and an auto insurance agent. Teens learn of the additional costs of drunk driving, such as attorney fees, court costs, increased insurance rates, and suspension or loss of license. The video features an experiment with a 27-year-old male subject. While completely sober, the man performs a reaction time test, completes a maze, and walks across a balance beam. Next, the man drinks a beer, receives a breathalyzer test, and completes all of the tests again. The man repeats these steps until he has consumed a total of six beers. The results are then discussed. In this clip, you'll hear from two highway patrolmen, a former prosecutor, an insurance agent, and the father of teenager who was killed by a drunk driver. Ashley discusses night driving and ways in which to make it safer. Then, she explains the importance of preparing for winter driving and provides tips on how to get around more safely when the roads are slippery. Next, she notes precautions to take when driving in rain and fog as well as how to handle driving in hot temperatures. Driving at night, in the rain, and in the snow each demand changes in your driving behavior. Ashley and two of the parent/teen combos reveal step-by-step procedures on how to respond to traction loss, tire blowouts, accelerator failure, engine failure, steering failure, and brake failure. In this clip, you'll watch Mark and Molly simulate steering failure in a parking lot. The Virtual Driver simulates a behind-the-wheel experience. This feature helps teach driver awareness as viewers are forced to pay close attention to what's happening to the front and rear of the vehicle in preparation of answering some difficult questions. As Ashley takes the viewer for a ride, they must answer a total of 15 questions. Watch a sample Virtual Driver question. The DVD set includes 8 interactive tests featuring 25 questions apiece. Each question is answered using the remote control for your DVD player. The DVD automatically scores each quiz. All of our questions are nearly identical to ones found at the DMV. These quizzes provide a great way to test your knowledge of the material. Each quiz features 25 questions which are nearly identical to ones found on the actual DMV written test. Our signs index includes the 50 common road signs you'll likely encounter. Teens can use the index for reference and to test their knowledge prior to taking their written test. New drivers can easily test their knowledge of 50 common road signs using our Index of Road Signs feature. Disc 2 includes a complete behind-the-wheel curriculum to assist parents in best instruction practices. It also includes bonus sections on car maintenance, road rage, and safe driving practices. Each Behind-the-Wheel lesson offers instructional tips for working with your teen in the car. Put Disc 2 into a computer's DVD-ROM drive to access printable pre-drive and drive packets. These worksheets will help you plan your behind-the-wheel lessons as well as provide a checklist of tasks for each lesson. A 9-minute video which covers the benefits of taking proper care of your vehicle. Includes step-by-step instructions on jumpstarting a dead battery and changing a flat tire. Learn tactics to avoid becoming a victim of road rage. Distracted driving, cellphone use, and common driving courtesy are discussed and illustrated. An ER nurse describes basic tasks you can use to help someone injured in a car crash. The seven in-car lessons are full of tips and advice on working with your teen behind the wheel. A short explanation of what parents and teens will learn with our In-Car Lessons. Ashley states the importance of parental involvement in teaching teens how to drive. She previews the in-car lessons and provides a minimum time frame in which to complete each lesson. All of the parents and teens offer tips for parents watching the video. These include: setting good examples, avoiding yelling, asking questions relevant to the driving experience, minimizing distractions, and taking breaks. John warns that all of the activities performed during this lesson should take place in a traffic and obstacle-free environment, such as an empty parking lot. John also discusses the proper starting and securing procedures, operational devices, and how to instruct teens on making proper turns. Adam reminds parents to review pre-driving tasks with their teen and explains common steering techniques. He also suggests teaching the pivot method when learning how to brake and accelerate. With the help of an animation, Ashley illustrates the proper way to proceed through curves. Ashley, Michelle, and Kim prepare parents for their teen's initial journey onto a roadway. Ashley explains how to teach backing in an empty parking lot before entering the street. Ashley also urges parents to practice in a low-traffic rural or residential road and offer tips on how to safely ease your student onto the roadway for the first time. Michelle explains how to determine following distance and gives tips on how to make turns. Kim speaks on the topic of right-of-way rules and how some of those rules are often forgotten or overlooked. Mark gives an in-depth explanation about space management. Additionally, he urges parents to start incorporating night driving into their lessons. Molly suggests parents allow an occasional role reversal. Ashley insists that parents ask their teens to respond to their surroundings as they drive. John and Adam return to help Ashley prepare parents for expressway driving lessons. John offers some great tips on easing nervous teens onto the expressway for the first time. John also suggests incorporating driving in poor weather conditions. Adam reminds parents to increase distractions as their teen gets more comfortable behind the wheel. Ashley urges parents to plan routes and encourage their teens to use maps. She provides an exercise designed to improve navigational skills and stresses the importance of parking in well-lit areas at night. Ashley, Michelle, and Kim warn parents of the dangers of vehicle malfunctions. Michelle provides an exercise that parents can use to teach teens how to respond if their car runs off the road. She also explains how to practice braking and steering out of potential problems. Kim discusses anti-lock brakes. Ashley discusses stopping distance and what to do if they get a flat tire while driving through a dangerous neighborhood. Ashley, Mark, and Molly wrap-up the in-car instruction by explaining when and how to give teens their final evaluation. Ride with Ashley as she defines three types of road rage: quiet road rage, verbal road rage, and epic road rage. Ashley also discusses how to safely respond to aggressive drivers and provides tips on how to avoid angering others while you drive. Ashley is then joined by her friends, Hassan and Danielle, and they discuss the dangerous driving activities they saw on their short drive to the park. Ashley explains how using a cell phone while driving can be as dangerous as driving drunk. She then talks about school bus safety, while Hassan and Danielle discuss drivers running red lights and how to determine a point-of-no-return for yellow lights. Take a short tour of our Road Rage and Safety Tips videos in this clip. Ashley highlights the benefits of taking proper care of your vehicle. She explains how to check tire pressure, tire tread, and how to change a tire. She lists the dangers of uneven treadware. Ashley also explains how to use jumper cables to jump start a dead battery. Ashley reviews under-the-hood items that should be checked on a regular basis. In addition, she warns that drivers should be aware of all gauges and indicator lights on their dashboard. To conclude this valuable video, Ashley lists warning signs that indicate that your car needs to be checked by a mechanic. An emergency room nurse then informs teens on proper actions to take if they are the first to arrive at the scene of an accident. Learn to change a tire as well as what to do in the case of an emergency. 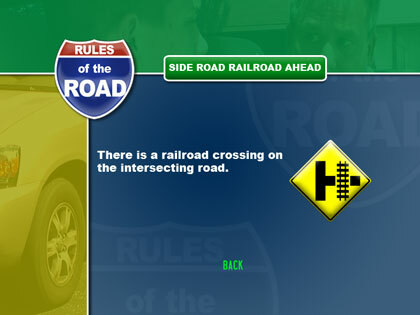 Rules of the Road features many animations to reinforce complex driving maneuvers. In the sampling below, view demonstrations of parallel parking, highway merging, determining the point of no return, and right-of-way rules. Watch a sampling of animations used throughout the DVD set. Rules of the Road features both English and Spanish subtitles for all of the main video and bonus video lessons on both DVDs except for the Virtual Driver feature. English and Spanish subtitles are included on both discs. By placing either disc into a computer's DVD-ROM Drive, you can access nearly 100 pages of printable documents. 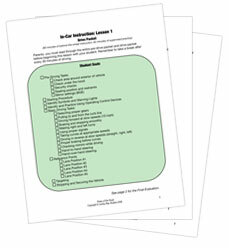 These documents are designed to assist parents with their teen's behind-the-wheel lessons. Click here to view the Lesson 1 Pre-Drive packet. Click here to view the Lesson 1 Drive packet. Nine printable Pre-Drive and Drive Packets are included to help your behind-the-wheel practice sessions. If you teach driver's education, you need to purchase the Instructor's Edition. If you're a new driver or the parent of a new driver and you wish to use Rules of the Road in your home, purchase the Standard Edition. Does Rules of the Road satisfy the requirements for my state? No. It does not currently satisfy any state requirement. It does not provide a certificate of completion. So, what's the point, right? If it doesn't get you "out" of some sort of arbitrary requirement, why should you bother with it? The answer is that our DVDs teaches you more than just how to pass a test. Our goal is to teach teens how to safely drive a car. So, we included much material that is beyond the scope of most online or book courses. For instance, our program includes material on jump starting a car, driving in rain, sleet, and snow, and even how to handle catastrophic vehicle malfunctions such as brake failure. Your new driver is going to be behind the wheel of a 3,000 pound missile. We believe that they should know more than just how to drive around the block and parallel park (which is the extent of most state's driving test). Does it come with a book? The Standard Edition includes the 2-Disc set. The Instructor's Edition includes the 71-page Instructor's Manual in addition to the DVDs. No. The DVDs can be viewed on any standard DVD player. All of the interactive features simply require your DVD remote. Inserting the DVDs into a computer's DVD-ROM drive gives you access to the printable pre-drive and drive packets. All of the dialogue is spoken in English. Subtitles are available in both English and Spanish on every copy. Is Rules of the Road just for teens? No. While it was designed with teens in mind, the material is still applicable and useful to any new driver, regardless of age. 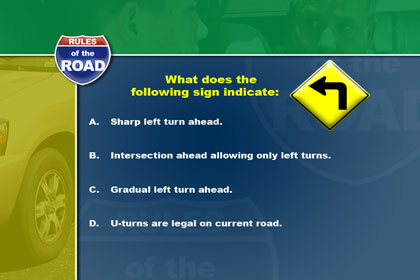 Does Rules of the Road cover the same material that will be on the DMV test? Yes. And a whole lot more! Our "Passing the Written Test" video covers nearly all of the material that will be covered on the written DMV test. Our eight interactive tests feature questions that are virtually identical to ones you would see at the DMV. Of course, once you've passed the DMV test, the real work begins! You have to learn to drive. And the Rules of the Road includes everything you need to become a safe, smart, and skillful driver. "This new edition represents a complete overhaul, featuring hours of new content, as well as printable guides, quizzes, and interactive DMV written exams, all aimed at helping budding motorists. Although aimed at teens, the program also supports parents, recognizing the fact that tensions often flare between the generations during the driver training period (some of these head-to-head confrontations are acted out here, followed by examples of healthier interactions). Chockfull of solid information smartly presented in an entertaining and comprehensive package, this is highly recommended. Editor's Choice." "I can honestly say that this is one of the BEST videos I have seen produced on drivers ed...the performances by the actors was great and the use of video and graphics made this series an awesome teaching tool!" "... is comprehensive and the format allows for easy maneuvering from one topic to the next. I really like the street sign section. The printable options is fabulous. The virtual driver and the quizzes were very good tools..."
"I found the virtual driver [feature] to be quite useful for parent and student in getting the big picture and what the novice driver should be searching for. Additionally, the practice exams are an excellent tool for student preparation for written test." "The constant focus on parent/child working together and understanding each other in order to produce a safer driving environment is great." "I felt the entire DVD was an excellent resource for all new drivers. I really enjoyed how it was done more from a student's perspective. Teen-to-teen interactions will hopefully have a bigger impact. I was very impressed by [Rules of the Road]. It's something I think every teenager should see before driver's ed. It's also very helpful to parents." "Overall, the series of lessons and information was rewarding." "Relates to youth with good visuals." The Standard Edition of Rules of the Road includes the 2-Disc set and is designed for new drivers and their parents. 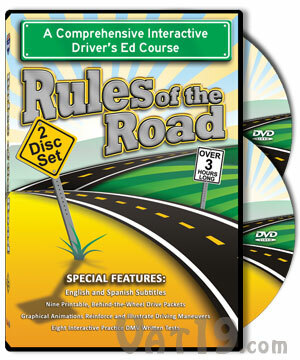 This 192 minute, 2-Disc Set is a complete and interactive driver's ed curriculum. Parents and new drivers, this is the version for you. The Instructor's Edition includes the 2-Disc set, licensed for classroom use, as well as the 71-page Instructor's Manual. If you're teaching driver's ed in a public school, a private school, or a for-profit driving academy, this is the version for you. What rights does the Instructor's Edition give me? It includes a public performance rights license. It gives you the right to display the DVDs to the public--which includes students in a classroom or driving school. There are no restrictions on the number of times you can display the DVDs or to the number of students to whom you can showcase the product. You cannot make any additional copies of the DVDs. I have 5 physical locations where I teach driving classes, do I need to purchase 5 copies of the Instructor's Edition? Yes. Each physical copy is licensed with public performance rights and that license is only good for that physical copy. Why can't I use the cheaper version? First, the Standard Edition doesn't include the convenient and useful Instructor's Manual. Second, it's a matter of usage. The Standard Edition is designed for home use. The Instructor's Edition is licensed to be used in a school or business setting. What if I don't want the 71-page Instructor's Manual? I just want to use the DVDs in my school or business. You'll still need to purchase the Instructor's Edition. We're confident you'll learn to love the Instructor's Manual. We only license the 2-Disc DVD set for public performance rights with the Instructor's Edition. The Standard Edition is priced for home use in which one family uses the product. In the case of a business, you are making money from the use of our DVDs. Your business is selling a service to your students. You are paid for each student that comes through your program and they benefit from viewing our DVDs. Therefore, it only makes sense that we should be compensated in some respect for each student that benefits from our DVDs. However, it is logistically infeasible for us to charge a fee for each student that views the DVDs. So, we've developed this license model that is easy to understand and is reasonably priced. Since there i no restrictions on the number of students that can view the program, the price is quite fair. I just want a copy for my teenager. Do I need this version? No, the Standard Edition is licensed for home use and that is what you need. How will you know if I purchase the Standard Edition and use it in my school or business? We won't. However, if someone were to alert us to an infringement of the license (perhaps an unhappy customer or disgruntled employee), our statutory recourse is $250,000 per incident. The Emergency Roadside Kit is a must-have for any driver's trunk.